1. Nikolai Sergeyev article headlined "Alexander Bastrykin Goes for Grave Crimes" says the most serious crimes will be handed over from the Investigation Directorate of the Interior Ministry and its regional departments to the Investigative Committee headed by Alexander Bastrykin; pp 1, 5 (630 words). 2. Maria-Luiza Tirmaste et al. report headlined "CPRF Refuses to Carry Out Elections" says the Communist Party of the Russian Federation (CPRF) has decided to boycott gubernatorial elections in a number of regions due unfair game-playing by the United Russia party; pp 1, 3 (1,026 words). 3. Oleg Rubnikovich and Alexander Zheglov article headlined "Informing Operators" says the Russian Investigative Committee has opened a criminal case against a former security service officer, Alexei Smirnov, and private detective Alexei Mikhailenko who attempted tapping the phone of a senior official from the Energy Ministry and accessed private text messages of subscribers of two mobile phone operators; pp 1, 5 (739 words). 4. Yegor Popov article headlined "VEB Relaunches Traktorniye Zavody [Tractor Plants]" says Vneshekonombank is going to break the agreement with the current management of the Tractorniye Zavody concern. The company may be given a new managerial team or split into parts; pp 1, 7 (938 words). 5. Article attributed to the paper's political section headlined "United Russia Members Leave Dmitry Medvedev's Call Unanswered" says United Russia's regional branches are not rushing to nominate candidates for the head of the party's central executive committee, the election of whom was announced by Prime Minister Medvedev; p 2 (611 words). 6. Alexei Shapovalov article headlined "Industrial Growth Stops" says industrial sector growth halved in Russia in the second quarter of 2012; p 2 (460 words). 7. Oleg Sapozhkov article headlined "It Will Be Handy for Customs" reviews amendments to the Customs Code drafted by the Eurasian Economic Commission; p 2 (732 words). 8. Anna Pushkarskaya and Maxim Ivanov article headlined "'It Is a Planned Rotation: People Are Getting Tired'" gives details of reshuffles in the Justice Ministry: two of the deputy ministers and former Federal Security Service officers were replaced by Dmitry Medvedev's associates; p 2 (624 words). 9. Sergei Goryashko article headlined "Just Russia Members Want to Control Their Mandates" says A Just Russia has submitted a bill to the State Duma allowing factions to distribute seats among party members of their own accord. The bill is expected to help A Just Russia give a deputy seat to Oleg Shein, known for his hunger strike following the Astrakhan mayoral election; p 3 (542 words). 10. Sergei Mashkin article headlined "Testimony Leaves Those Behind Anna Politkovskaya's Murder Unnamed" says former policeman Dmitry Pavlyuchenkov charged with the murder of journalist Anna Politkovskaya named his accomplices as part of the deal with the investigation. He failed to name the one who ordered the contract killing; p 4 (535 words). 11. Sofya Samokhina and Maxim Ivanov article headlined "High-Profile Crime Board" comments on plans to set up a special board of prosecutors within the Prosecutor General's Office to investigate crimes committed by senior officials, including personnel of the Investigative Committee; p 5 (583 words). 12. Maria Yefimova article headlined "Word of Peace Brought to Israel" says the main message U.S. Secretary of State Hillary Clinton brought to Israel was the new Egyptian president's pledge not to break the Camp David Accord; p 6 (479 words). 13. Sergei Strokan article headlined "Japan Provides Anti-China Service" says former foes Japan and Vietnam are to unite against their new rival, China. Tokyo is to help Hanoi in setting up the coast guard service; p 6 (478 words). 14. Yelena Chernenko and Maxim Yusin article headlined "Kremlin Wall to Protect Syria" says Russia and the West are facing confrontation over Syria. Ahead of his meeting with UN envoy Kofi Annan Russian Foreign Minister Sergei Lavrov made harsh statements accusing the West of blackmail; p 6 (581 words). 1. Alexandra Samarina article headlined "Special Surveillance Over Special Supervision" says a bill on setting up a new body to investigate violations committed by top officials has been submitted to the State Duma. President Putin is sending a signal to the elite that he wants to control the situation, experts note; pp 1, 3 (943 words). 2. Tatyana Ivzhenko article headlined "'Federative Republic of Ukraine' May Become Reality" says Crimean authorities demanding more independence are creating a sense of nervousness in Kiev. Experts believe that other Ukrainian regions may follow suit; pp 1, 6 (997 words). 3. Ivan Rodin article headlined "Young Politicians Being Sent to School at Kremlin" says the Communists will send young MP Yury Afonin instead of party leader Gennady Zyuganov, currently undergoing medical treatment, to the meeting of the State Duma factions with President Putin; pp 1, 3 (750 words). 4. Igor Naumov article headlined "Manual Regime Cannot Be Insured" says the Russian president is used to personally granting state compensations to the victims of natural and man-made disasters for years. The authorities do not want to develop an effective insurance mechanism to replace ad-hoc compensations; pp 1, 4 (857 words). 5. Mikhail Vyugin article headlined "Mayor Chosen for Putingrad" says Sverdlovsk region Deputy Governor Sergei Nosov has become the main candidate in the upcoming mayoral election in Nizhny Tagil; pp 1, 5 (493 words). 6. Vladimir Skosyrev article headlined "Party Increases Pressure on Army in North Korea" says unexpected reports on the resignation of the chief of the general staff of the Korean People's Army (KPA) Ri Yong-ho due to his illness have shown the beginning of a struggle for power among the North Korean ruling elite; pp 1, 6 (515 words). 7. Editorial headlined "Integration in Post-Soviet Space Skids" says not only Georgia and Moldova but also Ukraine are leaning toward the EU and NATO rather than integration with Russia. The article urges Moscow to revise its policy toward neighboring states; p 2 (513 words). 8. Alexei Gorbachev article headlined "Seliger Creates Competition" says the opposition is responding to pressure by the authorities to open more youth summer camps as alternative to the Kremlin-sponsored one on Lake Seliger; p 2 (834 words). 9. 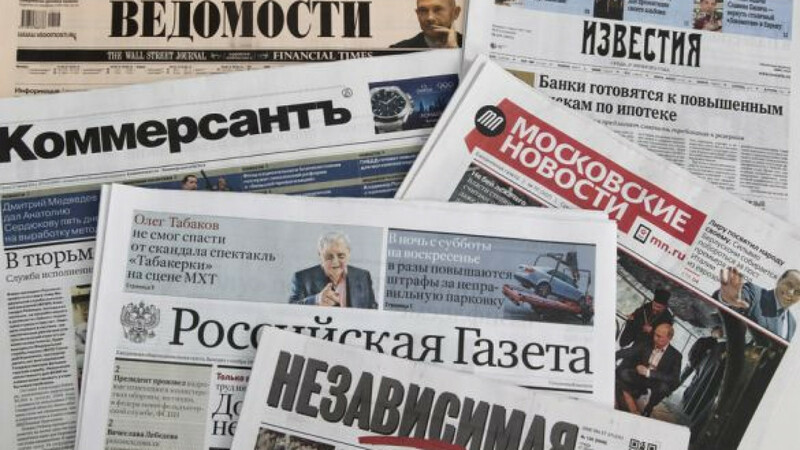 Olga Shulga article headlined "They Search for Foreign Agents Among Journalists" says that not only foreign NGOs but also some media receiving funding from abroad may be labeled as foreign agents as the United Russia party seeks to amend the law on mass media; p 3 (522 words). 10. Nikolai Surkov article headlined "Russia to Stand by Kofi Annan" says Russian Foreign Minister Sergei Lavrov has accused the West of blackmail as it urges Russia to support a new tough resolution on Syria in exchange for the extension of the international observers' mission; p 6 (590 words). 1. Alexei Nikolsky et al. report headlined "Police Hand Over Cases" says the police will hand over all serious cases to the Russian Investigative Committee by autumn; p 1 (335 words). 3. Dmitry Kazmin article headlined "Custom-Cleared Reputation" says the Russian Supreme Court of Arbitration believes that courts should be guided by the procedures of the European Court of Human Rights when hearing cases on damaging business reputation by Russian officials; pp 1, 3 (628 words). 4. Editorial headlined "Fight With Future" says the Russian government's plan to abandon the cumulative component of pension payments in order to resolve the Pension Fund deficit is ill-thought-out, stripping future generations of their pensions; pp 1, 4 (607 words). 5. Alexei Nikolsky article headlined "Army to Be Given Wings" comments on the Defense Ministry's plans to deploy 26 new brigades of the Ground Forces by 2020; p 2 (435 words). 6. Timofei Dzyadko article headlined "Timchenko Gets His Share" says one of world's largest oil traders Gunvor is reporting decreasing profit, while the dividends of the company's owner Gennadiy Timchenko keep growing; p 7 (532 words). 7. Another editorial headlined "Senior Comrade's Amendment" says President Putin's reaction to opposition protests shows that the Kremlin is disappointed with Dmitry Medvedev's liberal rhetoric; p 4 (317 words). 8. Konstantin Simonov article headlined "Greetings WTO" says the results of Russia's accession to the WTO are sill impossible to predict as the government and businesses have to learn to work in open market conditions; p 4 (431 words). 1. Svetlana Subbotina article headlined "State Duma Writing Equivalent of Defamation Law for OSCE" says the State Duma is drafting amendments to the OSCE regulations regarding defamation; pp 1 — 2 (658 words). 2. Maria Parfyonova article headlined "Skolkovo Advises Gazprom to Change Its European Strategy" says Skolkovo economic experts have advised the Russian gas monopoly, Gazprom, to change its long-term strategy and to pay more attention to gas spot prices; pp 1, 8 (1,135 words). 3. Natalya Galimova article headlined "People Front's doors closed for United Russia" says United Russia members will not be allowed to hold leadership posts in the All-Russia People's Front movement; pp 1, 3 (641 words). 4. Dina Ushakova article headlined "Visa Refuses to Issue Navalny Card for Political Reasons" says the Visa payment system has refused to support Alexei Navalny's project to issue cards that would allocate a small amount of money on anti-corruption activities from every card transaction; pp 1, 8 (372 words). 5. Igor Maltsev article headlined "Monopoly on Good Deeds" analyses the reasons for the conflict between the local authorities and volunteers working in flood-hit Krymsk; pp 1, 7 (640 words). 6. Anastasia Kashevarova and Dmitry Runkevich article headlined "NGOs to Become Foreign Agents of Their Own Accord;" says NGOs are asking lawmakers to amend the law on foreign financing to organizations, as NGOs could be break the law through being unaware of the second citizenship of their donors; p 2 (606 words). 7. Yekaterina Mokrova and Anna Akhmadiyeva article headlined "NTV Sued for Half a Million Over Distortion of Events of 1941" says a TV viewer has sued the state-run NTV channel over their documentary on World War II as it allegedly distorted the events of the beginning of the war; p 8 (575 words). 8. Olga Zhermeleva article headlined "Prosecutor General's Office and Audit Chamber to Audit Seliger Budget" will look into expenses of this year's pro-Kremlin youth summer camp at the CPRF's request; p 3 (450 words). 1. Yevgeny Shestakov article headlined "Annan Saves Peace" comments on UN envoy Kofi Annan's visit to Moscow in search of support for his Syrian peace plan; pp 1,8 (712 words). 2. Alena Uzbekova article headlined "Ministry of Food" comments on plans for the state support provided to Russian farmers; pp 1, 4 (1,163 words). 3. Ivan Yegorov article headlined "Medicine for Nightmares" interview with First Deputy Prosecutor General Alexander Buksman speaking on measures to be taken to protect the rights of entrepreneurs; pp 1, 5 (1,034 words). 4. Leonid Radzikhovsky article headlined "Tightening Screws" says the opposition are to blame for the Kremlin's reaction to their actions. The author says there will be no reform of the ruling system as the opposition cannot offer any alternative to the existing regime; p 2 (693 words). 1. Mikhail Rostovsky article headlined "Country of Bans" criticizes the State Duma for passing a number of laws restricting civil activity in the country; pp 1-2 (668 words). 2. Yeva Merkacheva article headlined "Criminal Lords Meet Head-On" comments on the theories of the death of Rostov police chief Vyacheslav Chuprunov; pp 1, 3 (1,392 words). 3 Ulyana Urban article headlined "All World Goes to London" reports on the preparations for the London Olympics; pp 1, 8 (847 words). 1. Sergei Minenko article headlined "Wiretapping Being Served" says the practice of tapping into phones of high-profile officials has been revived in Russia; pp 1-2 (900 words). 2. Alexander Baranov article headlined "At Crouch Start" describes London's preparations for the Olympic Games; p 4 (1100 words).